Construction, remodeling and redecorating in the workplace or home often involves painting walls and ceilings. Occasionally, this means that life safety systems such as automatic fire suppression sprinklers also get a facelift – which can actually be detrimental to the functioning of the system. The urge to paint over your fire sprinkler heads is completely understandable. Having a metal sprinkler head on the ceiling might look like a glaring omission and clash with a carefully planned and otherwise well-executed paint job. Sometimes painting over your fire sprinkler heads is an accident, and you may not even realize it’s been done until it’s too late. This can easily happen if you hire another person or company to paint, or if you’re using a paint sprayer to quickly coat a large area. But painting over a fire sprinkler head is one of the most dangerous mistakes to make. It can lead to a costly repair job, and as this San Diego home inspector explains in an informative video, it can also put lives at risk. An automatic fire sprinkler system is comprised of a network of pipes filled with pressurized water or air (when air pressure drops, water fills the system and flows through the activated sprinkler head). The piping is installed behind walls and above ceilings with individual exposed automatic sprinkler heads installed from these pipes at ceiling height. When the sprinkler heads are activated the water is easily directed to the areas below. In the event of a fire, heat rises above the sprinkler head, and when the temperature reaches a certain point, the sprinkler head activates, spraying water over the flames. 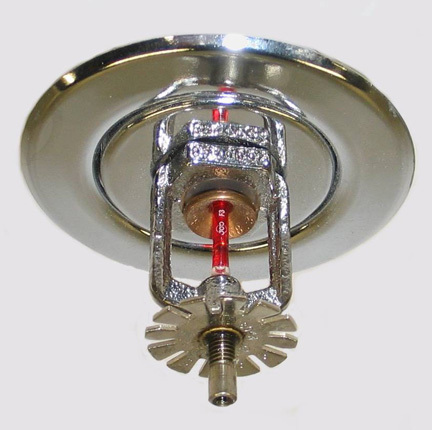 In most cases, the sprinkler head can extinguish the flames, or at the very least control the heat and smoke until the fire department arrives. The crucial component in a fire sprinkler is the colored glass bulb in the sprinkler head. As the temperature rises in the event of a fire, this bulb breaks, letting a valve above it drop down and release water through that head. If the sprinkler head is painted over, the paint will actually protect the bulb, preventing it from breaking at the right temperature and prevent water from being released. Painting over the sprinkler head may also prevent the valve from dropping even if the bulb breaks. Some automatic sprinkler systems that are in finished spaces install a cover plate over the sprinkler head. Similar to the glass bulb, these cover plates react to a specific temperature and drop off, allowing the sprinkler head to be exposed to the fire and activate. Painting the cover plate changes the temperature needed for the system to work properly. Another major maintenance concern for fire sprinkler systems is Microbiologically Influenced Corrosion (MIC). It’s important to periodically check to see whether your system piping has pinhole leaks. The sprinkler water itself should be checked for any black coloring, and to see if it has any offending odors. The concrete around the pipe should be checked for rust staining. If you see any of these signs during maintenance, MIC could be an issue. The earlier it is discovered, the easier it will be to repair and avoid future repair costs. See Corrosion Frequently Asked Questions. By regularly checking fire suppression system pipes for corrosion, and making sure that sprinklers haven’t been painted over, you can better ensure the safety of everyone. And if you have these types of systems in your home, it’s important to be just as diligent to make sure your system will work properly in case of a fire. If you must paint the area around your fire sprinkler heads, be sure to cover them with paper and tape the area around the ceiling, taking care not to disturb the sprinkler head itself. And remember to share this information with anyone you hire to paint for you. To learn more about fire sprinkler safety, visit Fox Valley Fire.